Departing England in the spring of 1819, Franklin (age 33) and his partynotably, John Richardson (31), surgeon in the Royal Navy, and officers-in-training George Back and Robert Hood (both 22)began an expedition that was to last three and a half years. Their formal charge was that of determining the latitudes and longitudes of the Northern Coast of North America, and the trending of that Coast from the Mouth of the Copper-Mine River to the eastern extremity of that Continent (Franklin, p. xi). They were also to make meteorological observations, record variations of the magnetic needle, noting particularly the effects of the Aurora Borealis on them, and to make drawings of the land, natives, and objects of natural history. Due to the logistics of getting supplies and men through the network of rivers and lakes between York Factory on Hudson Bay to Slave Lake and then north to the sea, only one month was actually spent along the uncharted coast. This main accomplishment, the exploration of some 350 miles of northern coastline between the mouth of the Coppermine River and Point Turnagain on the Kent Peninsula, cost the lives of eleven men (Indian interpreters, voyageurs, and Midshipman Hood) out of their original twenty. The heroic-romantic watercolors that Back painted during the northward journey, to and along the coast, belie the tremendous misery and suffering endured during the group's retreat, as winter quickly arrived in late August 1821. 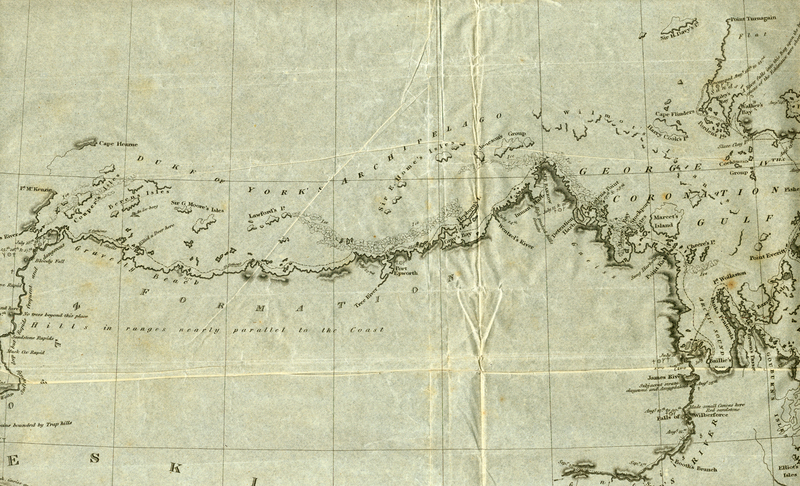 Their lack of provisions and the length of the voyage back up the Coppermine to Fort Providence on Great Slave Lake convinced Franklin to change his original plans: they would now proceed up the recently-discovered Hood's River, then cross overland to Fort Enterprise, which had been their previous winter's home on Winter Lake, approximately 70 miles north of Fort Providence. Wearing damp clothes in freezing temperatures, living mostly on a lichen called tripe de roche and on boiled old shoes and scraps of leather, a smaller and much emaciated party arrived at Fort Enterprise, finding no provisions and no Indians as had been expected and arranged for. In the previous year, there had been little snow and they had been surrounded with herds of reindeer; now, Franklin ruefully noted, there were few tracks of these animals and the snow was two feet deep. Back, who had been a few days ahead of Franklin's group, had already gone to Fort Providence to get help and food. Richardson, who with Hood had remained behind Franklin to assist weakening voyageurs, eventually reached Fort Enterprise, only to describe in harrowing detail the murder of Hood, the murder and probable cannibalism of one voyageur by another, and his own decision to kill the perpetrator of both. Back's heroic overland feat was successful, for Indians sent by him arrived with food on November 7. The conditions of Franklin and the remaining men gradually improved over the winter and spring months, and eventually, on foot and by canoe, they returned to York Factory on 22 July 1822. And thus terminated, Franklin wrote (p. 494), our long, fatiguing, and disastrous travels in North America, having journeyed by water and by land (including our navigation of the Polar Sea) five thousand five hundred and fifty miles. The expedition proved to be a great learning experience regarding tactics, equipment, and physical requirements, which would prove valuable in subsequent British exploration efforts in the Arctic.